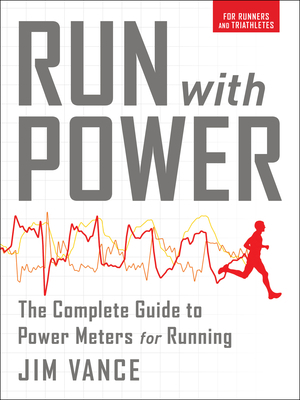 RUN WITH POWER is the groundbreaking guide you need to tap the true potential of your running power meter. From 5K to ultramarathon, a power meter can make you faster--but only if you know how to use it. Just viewing your numbers is not enough; you can only become a faster, stronger, more efficient runner when you know what your key numbers mean for your workouts, races, and your season-long training. In Run with Power, TrainingBible coach Jim Vance offers the comprehensive guide you need to find the speed you want. Run with Power demystifies the data and vocabulary so you can find and understand your most important numbers. You'll set your Running Power Zones so you can begin training using 8 power-based training plans for 5K, 10K, half-marathon, and marathon. Vance shows you how you can compare wattage, heart rate, pace, and perceived exertion to gain the maximum insight into your performances, how you respond to training, and how you can train more effectively. Run with Power will revolutionize how you train and race. Armed with Vance's guidance, you can train more specifically for races, smooth your running technique, accurately measure your fitness, predict a fitness plateau, monitor injuries, know exactly how hard you're training, get more fitness from every workout, recover fully, perfect your tapers, warm up without wasting energy, pace your race on any terrain, know when to open the throttle, and create an unprecedented picture of yourself as an athlete. If you're just glancing at the number on your wrist or computer monitor, you've got a lot more speed potential. Knowledge is power and understanding your power numbers can open the gate to new methods and new PRs. Run with Power introduces the use of power meters to the sport of running and will show you how to break through to all-new levels of performance. Key concepts explored in Run with Power 3/9 Test, 30-minute Time Trial Test, Running Functional Threshold Power (rFTPw), Running Functional Threshold Pace (rFTPa), Averaged and Normalized Power (NP), Intensity Factor (IF), Peak Power, Variability Index, Efficiency Index (EI), speed per watt, Vance's Power Zones for Running, Training Stress Score (TSS), and Periodization with Power. Includes 6 testing methods and 8 power-based training schedules and workouts for 5K, 10K, half-marathon, and marathon. Jim Vance is a TrainingBible coach and former professional triathlete. He trained under the guidance of the national team coaching staff at the US Olympic Training Center. He recorded two world championship titles as an amateur in XTERRA and International Triathlon Union. His range of performances also stretches to Ironman; he finished third overall at the 2006 Iron-man Florida in a time of 8:37:09, running a 2:54 mar-athon in that race. As the founder, team director, and head swim coach of Formula Endur-ance, a USA Triathlon High Performance Team in San Diego, Jim focused on developing youth and junior elite triathletes. He is also a Level 2 and Youth & Junior Certified Coach for USA Triathlon as well as an elite coach for Training-Bible Coaching. He has coached national champions and world championship podium finishers, both amateurs and elites. Jim has twice been named the USA elite head coach at the duathlon world championships. Jim is the author of Triathlon 2.0: Data Driven Performance Training, which teaches athletes how to use technological training tools such as power meters, GPS, and heart rate monitors for Ironman triathlon racing based on their age, gender, and goals. In 2013, Jim coedited the book Triathlon Science with best-selling endurance training author Joe Friel. Jim holds a BS in physical and health education, K-12, from the University of Nebraska, where he ran track and cross country and won two academic scholarships. He was a schoolteacher for six years before committing to triath-lon full time in 2005. He retired from triathlon competition in 2010. Jim currently resides in San Diego with his wife and two young sons. He coaches high school swimming at Coro-nado High School and coaches a number of beginner and aspiring elite triath-letes, runners, and cyclists. His website is CoachVance.com.